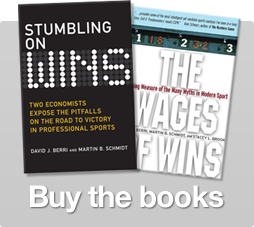 The research that Wins Produced is based on is point differential, which is also used by both Dean Oliver and John Hollinger (at the team level) — see Calculating Wins Produced. And this method works remarkably well at explaining wins. We should note that Berri, Oliver and Hollinger have all become names in advanced statistics in the last decade and a half. Which is why Hubie Brown is remarkable. In Loose Balls: The Short, Wild Life of the American Basketball Association by Terry Pluto, there are some great quotes by Hubie Brown. Enjoy! To me, a crucial statistic is point differential. If you average 100 points and give up 100 points, then you’ll win half of your games. If your point differential is three— you score 103 and give up 100— you have a very good chance of winning 50 games. You want to win 55 games? Then score 105 and give up 100. I’m telling you right now, a team that has a point differential of five will win at least 50 games. You can write that in cement. By the end of the season, our point differential was seven— 109 to 102. That’s astronomical. That’s the stuff of champions. And in the last 25 games where we won 22, we averaged 108 points and allowed 92, which is off the charts. Amazingly Hubie Brown was able to get the stats behind what wins games. It’s important to note he was coaching in the 70s, when the modern box score had not been around for that long. CI thought the ball wasn’t being distributed correctly before I came to Kentucky. Artis was taking only seven to nine shots a game (actually 14, averaging 18.7 points) and we raised that (to 16 per game and 23.6 points). Artis just had to see the ball more. I thought he had an unfair rap when people said he had bad hands. But you had to figure out what he could do. Put him on the low block, the right-hand side. Get him the ball and watch him shoot that little left-handed hook. Aside from Wilt Chamberlain, Artis Gilmore is the strongest man ever to play this game. I do enjoy that Hubie Brown also proves that his memory isn’t perfect. I also like the idea that Hubie Brown thought that giving the big man the ball more (and notice that it wasn’t dramatic) was a good idea. First, we like Artis Gilmore around here and I always like people that recognize him as a great. Next, I more than appreciate that his view of clutch is not restricted to scoring. Yes, it’s awesome to hit the last second shot, but getting the ball for your team can matter hugely as well. Seeing these quotes made me appreciate Hubie Brown and his understanding of the game. One other interesting thing to note is that when we examine coaches that were able to change player performance significantly, Hubie Brown (in his time in the NBA) was not found to impact player performance. And this makes me revisit a thought I’ve had before. Understanding a problem may not always translate to solving the problem. Things like lineups and chemistry may not be as easy to solve as we’d like. That said, it’s refreshing to see that Brown was able to recognize what wins games a full 20-30 years before the “advanced” stats movement came about. 8 Responses to "Revisiting the Wisdom of Hubie Brown"
That’s beyond obvious that “media” doesn’t understand what wins games. They like headlines not truth. Clearly, if you have a guy who can do WHATEVER it takes to increase his teams chances to gain points …. is a winner. Not just some guy who shoots his career FG% at the buzzer, lol, so laughable the ignorance that we live in. It would seem to me that looking at coaches and young players (maybe even in college) is worth some study. You can’t teach an old dog new tricks appliesto pprofessional athletes according to DB. Hey Andres, I broke down how much of a role shot locations play on defensive rebounding rates, and showed which teams are over/under rebounding, which I attributed mostly to skill. Its some interesting data, so check it out whenever. I took a quick look at the Cavaliers last night to see how they were rebounding since Varajao was injured. I was expecting their rebounding to take a serious dip without him. It doesn’t look like that’s the case (at least so far). It appears that Tristen Thomspon has suddenly improved from good to great rebounder and is making up most of the difference. Is there something in your data that could explain some of that? Although my data only encompasses the 2011-2012 season, I think I can explain a large chunk of that. In both 2012 and 2013 the Cavaliers were/are a slightly under average defensive rebounding team. From the research I did, the Cavs were one of the few teams who were rebounding at almost the EXACT rate they should have been, given the types of shots they forced opposing teams to take. Therefore, we can infer that the Cavs rebounding isn’t due to individual prowess (Verajao), but to the type of defense/system they play in. I would of course like a larger sample size, but based on the results we’ve seen so far, this hypothesis seems fairly accurate. I think it is incorrect to state that coaches don’t impact winning – rather it is that in the NBA you have (probably) the 30 best active coaches competing against each other. Being really good just gets you there, and then the parity of coaching talent makes it seem like they’re not contributing. But change out one of the coaches for some random youth league coach, and my guess is that they would start “negative” contributions. I think one thing that should be acknowledged is that pretty much every team in the league tracks stats that aren’t in the box score from deflections to hockey assists(and many more), and many teams have been doing this for years. To me it seems like the popular advanced stat community(Holinger, WOW, Oliver)draws a line at the box score and makes concrete statement based only on the box score. Useful for sure but you could add about 20 or 30 or who knows how many stats to the basic 9 or 10 that are used now.